Viking 99 is the perfect setting for an international police force. Civilian police officers from three countries will work side by side during Viking 99 and co-operate with armed forces officers from 24 countries and a number of civilian organisations. Ready for co-operation and training. German Civilian Police Colonel Adalbert Gross in front of a part of the multi-national Viking 99 Police Force. 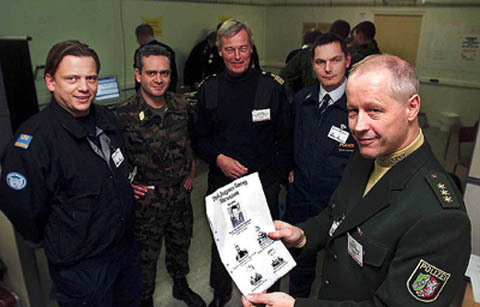 From left: Swiss Police Officer Alexander Küfter, Swiss Colonel Jacques Baud, Swedish Chief of Staff, Superintendent Nils-Henrik Roskvist, and Swiss Inspector Robert Clément. 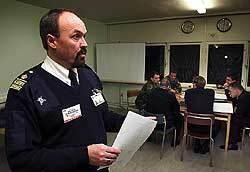 German Civilian Police Colonel Adalbert Gross is convinced that a computer assisted exercise like Viking 99 provides participants with a lot of useful knowledge and experience. "It is interesting to learn how the military forces and other participants work", he says. In Bosnia, Kosovo, Albania, East Timor, Western Sahara and other places where international operations have been conducted, civil police have been important participants from the very start.Tasks they perform include; monitoring, training, advice to local police authorities as well as investigations concerning violations of human rights, as in cases of torture and harassment of dissidents. During Viking 99 the 18 participating civilian police officers are receiving training in these areas. There are 15 Swedes, three Swiss and one German, some of whom became acquainted while participating in previous international missions. "There is a common view of police work and police force tasks among police officers from different countries", Swedish Superintendent Peter Lundström says. As members of a peace keeping operation the civil police officers mainly try to get the local police to do their job according to internationally accepted standards. "The big difference is that these operations are much more difficult and we operate in a tense environment. We also co-operate with police and military forces from other countries as well as civilian organisations", says Superintendent Peter Lundström, Head of Swedish Foreign Police Operations. Many of the participants feel that Viking 99 will provide important experience in co-operation, as well as faciliating the development of new international contacts and training in decision-making. German Civilian Police Colonel Adalbert Gross is convinced that a computer assisted exercise like Viking 99 provides participants with increased knowledge and experience: "It is interesting to learn how the military forces and other participants work." Swiss Police Officer Alexander Küfter and Swiss Inspector Robert Clément agree with him. They really appreciate the international contact and feel sure that they can take something home with them. "Meeting colleagues from other countries is important", Alexander Küfter says. 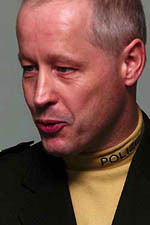 Chief of Staff, Swedish Superintendent Nils-Henrik Roskvist, served in Civilian Police forces in former Yugoslavia for three years and before that in Gaza and Cyprus. He stresses the importance of co-operation. Superintendent Nils-Henrik Roskvist comments, "An exercise like this is good for developing methods of co-operation and training."